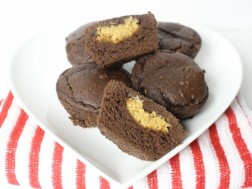 Do you crave chocolate peanut butter cups? We do! Here’s a version that is redefined – they are lower in sugar, completely flourless, dairy-free and gluten-free, but every bit as decadent! Because they’re made with black beans, these sweet treats are also a great way to get more fibre and protein into your diet. A ‘health’ food never tasted so good! Combine beans, coconut oil and eggs in a blender or food processor for 1-2 minutes until smooth. Add the remaining ingredients (except peanut butter) and blend for another 1-2 minutes. Fill 12 silicone muffin cups (or parchment muffin tin liners) halfway and top each with 1-2 teaspoons of natural peanut butter. Lightly press the peanut butter down into the batter. Bake for 15 minutes. Let these cool fully before taking them out of the muffin cups…enjoy!